One of the UK’s leading suppliers of high quality punching technology is celebrating its 50th birthday in style by aiming for a record-breaking year. Bruderer UK, which was formed in Luton in 1968, has just smashed the £5m turnover barrier for the first time in its history and is now setting its sights on adding a further £1m of orders for new presses, ancillary equipment and service packages over the next 12 months. The company is also set to take its biggest ever presence at MACH 2018. “2018 is a massive year for Bruderer, with our UK operation 50-years old and our parent company in Switzerland actually celebrating its 75th,” explained Adrian Haller, Managing Director of Bruderer UK. 2017 was a great year for Burderer UK, with orders coming from clients involved in automotive, construction, electronics, medical and new energy. High speed precision presses in demand have ranged from the BSTA 180kn through to the BSTA 2500kn, together with the Bruderer Planetary Gearbox. 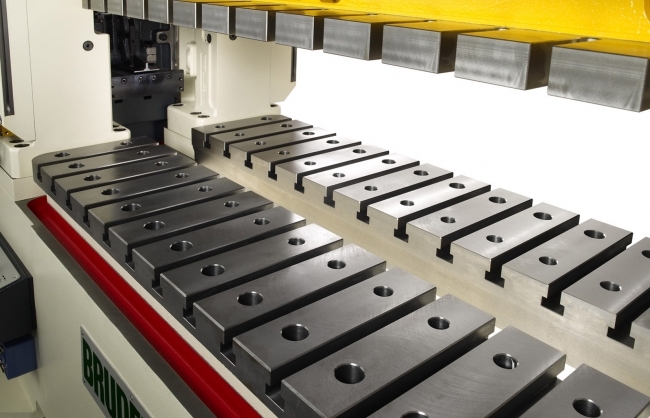 This gives the customer the ability to control the development of the stamping process for forming and achieve production rates from less than 1 stroke per min through to 2500 strokes per minute. Clients are getting two machines in one, capable of developing and proving a component as well as delivering high volume production. The most high-profile job from the last twelve months originated from South Wales, with Bruderer installing the BSTA 1600-117B2 at the Royal Mint. This machine is capable of up to 825 strokes per minutes and gives the world famous institution the opportunity to produce 10,500 £1 coins every 60 seconds. Adrian concluded: “To celebrate our 50th birthday, we’ll also be making a special announcement that will hopefully leave a legacy for the next 50 years. Bruderer UK, which employs 14 people at its headquarters in Luton and at a satellite facility in the Black Country, has recently taken on a young service engineer to help it cope with expansion with plans also in place for further recruitment of experienced staff and apprentices to futureproof the business.